Mordian 7th Regiment: Armies & Legions & Hordes arrives on the scene! 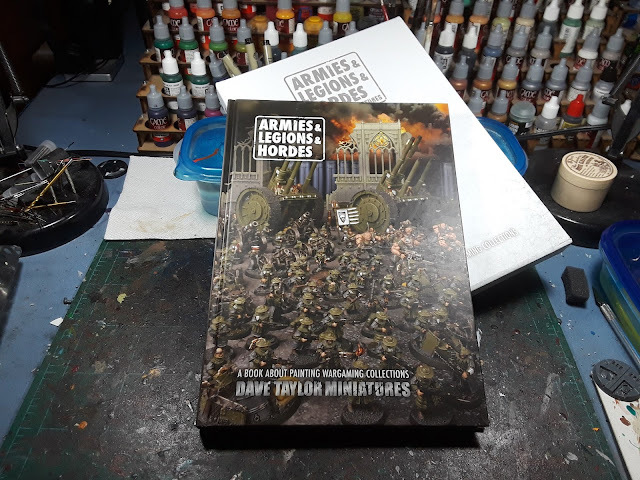 A little while back the tremendously talented Dave Taylor made a Kickstarter for his book "Armies & Legions & Hordes" and I immediately chipped in, knowing that it was going to be something truly special. The Kickstarter was a success, the book arrived earlier this week and it is absolutely fantastic! 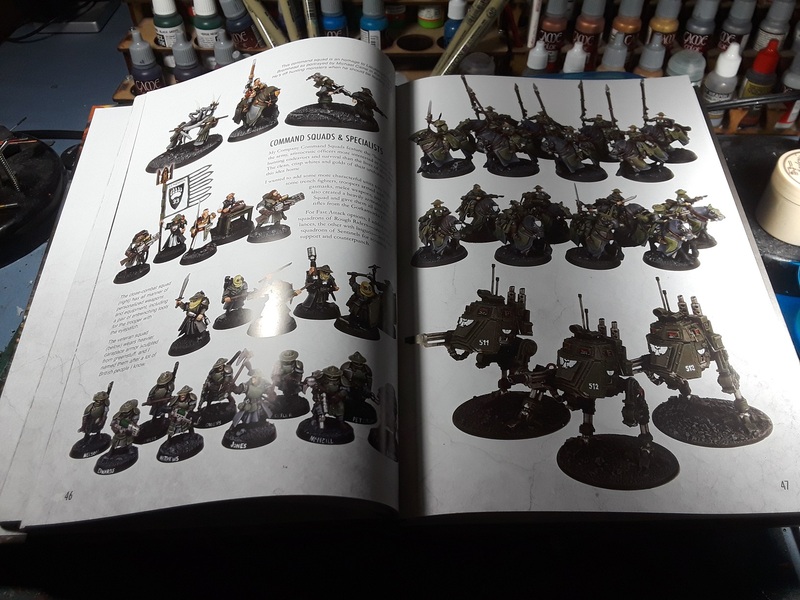 It came in a beautiful slipcase and in general size and shape reminds me of the awesome Imperial Armour books from Forge World, always a good comparison! The book spools through Dave's history with gaming and offers a ton of insight into his time working in the hobby, all of which is fascinating. 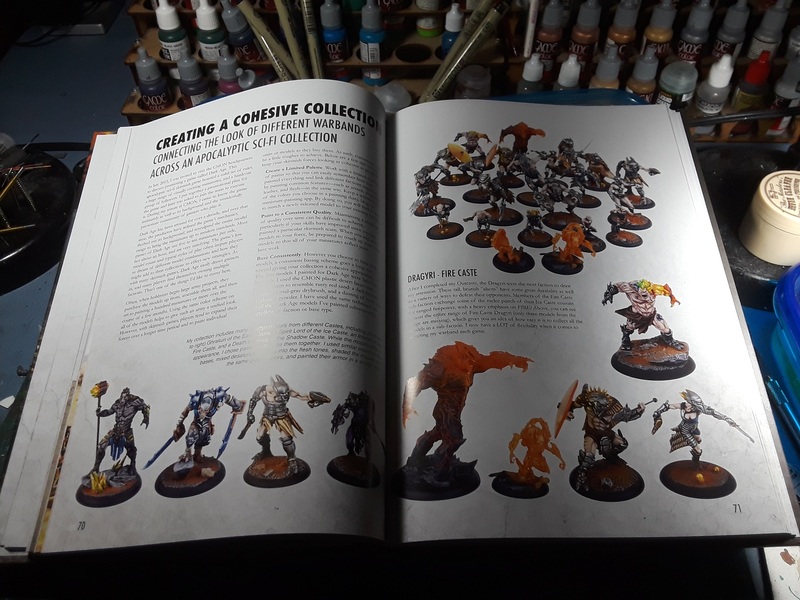 Accompanying this glimpse into the process are a metric TON of fantastic photos of his work throughout the years, many of which have graced the pages of White Dwarf, Wargames Illustrated and more! 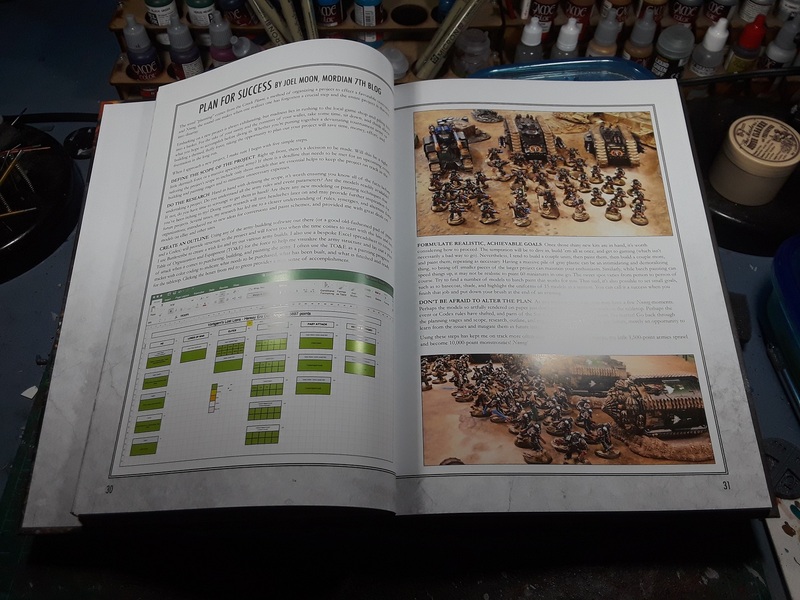 It's not all GW stuff either, Dave has explored many other systems and the book is chock full of beautiful miniatures from other games such as Dark Age, Bolt Action, etc.! 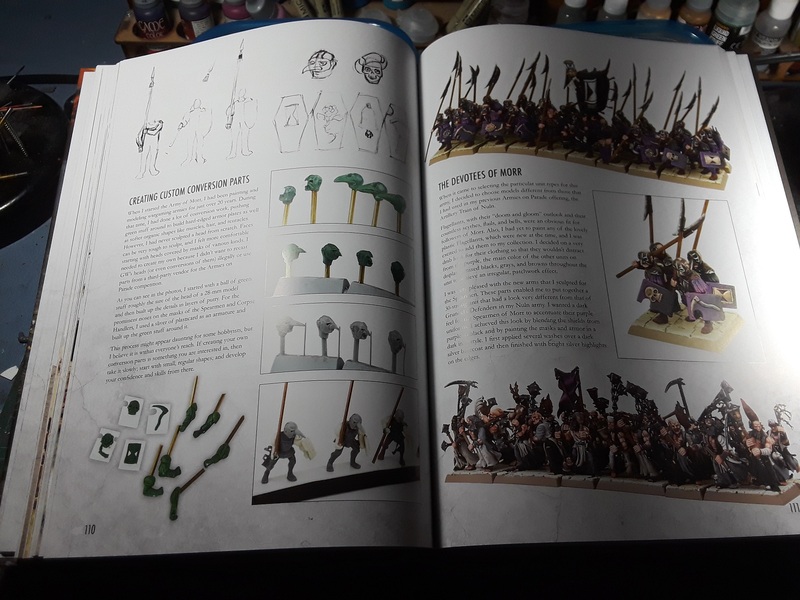 It also has a ton of insight into how he approaches all the crazy and wonderful conversions he's done over the years including the Genswick Rifles, his stunning Army of Morr and many more. Many Morr? The book also includes several articles from other folks from around the hobby adding their insights into various aspects of wargaming goodness, and I'm quite humbled and honored to have been able to contribute some of my inane ramblings to the book - The painting chart that I'm so fond of using made its way into the pages alongside articles from some of the true giants of the hobby. So cool! If you didn't get a chance to pick up a copy as part of the Kickstarter, as I understand it plans are afoot to get the book out into the wild for public ordering. As I find out more I'll be sure to get the info out to you all - It is a tremendous book from a tremendous chap, and I cannot recommend it highly enough! Cheers, Dave! With the recent deliveries here in the US I have had a lot of people ask about availability. Well I can now announce that there are quite a few ways to get a hold of the book, in both physical and digital forms. Please pass this information on to your friends who might have missed the campaign. - in March, your FLGS will be able to order the book from Alliance Game Distributors. So if, like me, you like to support your local store you can still do that. - Ironheart Artisans now has Armies & Legions & Hordes in stock in their webstore: https://ironheartartisans.com/shop/ Head to their store and click on the Dave Taylor Miniatures button to take you through to the Hardback book (including limited quantities of the KS slipcase) and the PDFs of the book, plus the Bonus PDFs that I created for BackerKit. - Winged Hussar Publishing will be carrying my book at their booth at the following shows: Cold Wars, AdeptiCon, Historicon, and Fall-In. - Mighty Ape is, I think, being supplied by Warlord, and will hopefully have a restock soon. - Alternatively, check with your local supplier of Warlord goodness and see if they can get it in. - Ironheart Artisans or Warlord Games will be your best bet for securing a copy. Thanks again, everyone! You have set something very cool in motion, and I look forward to creating quality products for you for years to come. In fact, if you're in Nottingham (as I am), you can do what I did - walk into Warlord Games physical store and pick it up direct from them! Excellent news! It really is a great book, definitely worth picking up a copy! As a contributor you should have got an autographed copy!